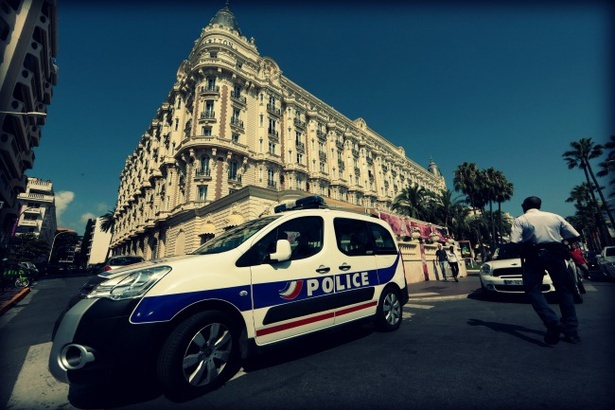 A gunman stole $136 million of jewelry from an exhibition at the Intercontinental Carlton Cannes hotel in July. Investigators and gem experts are still wondering how it happened. The terrace doors of the opulent Intercontinental Carlton Cannes hotel on the French Riviera were supposed to be locked. But before lunchtime on the last Sunday of July, a thief—whose face was obscured with a bandanna and a motorcycle helmet—managed to slip through them and directly into an exhibition room loaded with millions of dollars worth of Leviev diamonds, "the world's most extraordinary." Armed with an automatic pistol and an uncanny familiarity with the setting, the mystery bandit began his heist. "He was professional and very rapid," Philippe Vique, a deputy prosecutor for the region based in the nearby town of Grasse, told the New York Times a day later. Vique told The Atlantic he was no longer divulging details about the investigation, which is ongoing. The robber was not confronted with a particularly intimidating scenario. Because the exhibit had not yet opened, there were no hotel guests or customers milling about. In fact, he had arrived at exactly the most opportune moment, just before the high-profile jewels were to be loaded into secure display cases. He did have to contend with a small group that had gathered in the room: two vendors, a show manager, and three unarmed private security guards, according to the Associated Press. But the threat of the firearm was evidently enough to hold them off. They watched as he seized a briefcase and a box full of jewels belonging to Israeli diamond and real estate billionaire Lev Leviev. The haul contained 72 pieces, 34 of which were considered "exceptional" because of the gems' unblemished clarity, brilliant color (which, in diamond circles, sometimes means no color at all), large carat weight, and their intricate cuts and polishes by master craftsmen. The company aims to deliver natural, non-treated gems, meaning that it avoids dyeing, filling, and other processes frequently used to enhance the clarity and color of raw stones. The loot included "many high karat, internally flawless colorless diamonds along with large pink and yellow diamonds, and emeralds and sapphires, set in platinum and 18k gold,” according to Forbes. Press reports suggested that the unidentified intruder made his getaway through a side door. But a source close to the investigation told The Atlantic that he climbed through a window, lugging $136 million worth of bounty with him, hopped the five or so feet down to the street, and fled on foot. Some of the jewels came loose and scattered onto the ground. No one pursued him. The operation was the largest-value jewel theft in French history, and one of the biggest in the world -- and all it took was some brute force and about 60 seconds. As if this weren't enough to satisfy the requisites of any good jewel-heist movie, the crime had yet another flourish. It occurred in the same hotel that Alfred Hitchcock shot much of the classic 1955 romance-thriller To Catch a Thief. The film follows a reformed burglar (Cary Grant) who—in pursuit of a copycat—falls for a seductive bon vivant (Grace Kelly). Though gun laws in France make it extremely difficult to arm private security personnel, American and European experts in high-profile jewel crime agreed that something was amiss at the Carlton. They alternately described the conditions at this particular event as "ridiculously insecure," "painfully inadequate," or, as Martin Winckel, a jewel expert who runs the Germany-based International Jeweller Security Service, phrased it in an email: "there was no security!" The event's organizers should have been prepared for an attempted breach, the experts say. A few months earlier, during the course of the Cannes Film Festival in May, thieves outmaneuvered 80 security guards at the nearby Hotel du Cap-Eden-Roc in Cap d'Antibes to pilfer a single $2.6 million De Grisogono necklace. A week before that, cat burglars broke into the Novotel hotel room of an employee of the Swiss jewel and watch maker Chopard and wrenched a safe containing $1 million worth of jewelry out of the wall. According to Anthony Roman, CEO of the global risk management firm Roman & Associates, the security architecture at the Carlton did not resemble anything like what his company would have devised, especially after the recent spate of crimes. These types of venues and high-value products, Roman explained, need a clear, central command that oversees several perimeters, including undercover guards monitoring for getaway vehicles or other suspicious activity outside the building. "Detection is the primary weapon in this type of security plan," he said of the optimal setup. "Detect what's going to happen before it happens, and interrupt it there. The robbers are not looking to get into a shootout 40 yards from their target." Under a more rigorous system, Roman said, every access point should be manned, and guests should only be able to reach the "outer ring" of an event before they come face to face with security personnel. These types of checkpoints can also be masqueraded as champagne registrations and the like so that the event doesn't sacrifice its elegant aesthetic. If such a plan was in place at the Carlton, the thief probably wouldn't have made it up the terrace steps, let alone through the French doors. Security would have immediately marked a guy lingering outside an entrance as a threat, approached him casually, offered help, and told him that he was in a restricted area, Roman said. Usually, such an approach spooks the would-be criminal, Roman observed, and he'll improvise an excuse about looking for a bathroom before making a swift exit. But even a more sophisticated criminal who vaults past the initial layers of security and makes it to the room holding the jewels can still be thwarted by a secure holding case. At minimum, Winckel said, the jewels should be placed in a show case with "unbreakable laminated glass and electronic locks with time delay for opening." If cracking the electronic code or breaking into the case takes more than a few minutes, the thieves will usually abandon the operation. The most secure cases are built to resist the force of hammers, sledgehammers, crowbars, and even guns. "If such show cases are used, the only dangerous time is the [distance] between a vault and the show cases," Winckel added. This distance "must be as short as possible" and, Winckel wrote, the jewels must be accompanied by armed guards. In the case of the Carlton, the jewels were lying prone, and the guards were unarmed. "I am, also being a jeweller, very angry about the insurance companies who insured such a high risk with so low security," Winckel wrote. "Jewellers with a very, very smaller risk and value have to install an perfect alarm system, CCTV, unbreakable laminated glass, locked doors, guards etc. to get insurance! In this case there was no adequate security and it was insured by [Lloyd's of London] and some more reinsurers!" If the cases are ever compromised or the thief happens to enter at exactly the right time, as he did at the Carlton, the outer perimeters should be able to halt the thief's progress. "A commander should know where each security guard is," Roman said. "They should immediately know there's a robbery in place and should have a plan to interrupt it. ... If he gets in, he's not getting out." Strong coordination with local authorities—which were not even aware of the Carlton exhibition—could be especially beneficial in this case. A nearby officer could have responded to calls over a radio, and stopped the thief as he hit the sidewalk. The marketing of the event also seemed a bit hapless. Large, splashy pink signs on the front of the hotel advertised the valuable Leviev wares and the month-long exhibition. John J. Kennedy, the president of the New York-based trade association Jewelers' Security Alliance, which advises law enforcement agencies on such matters, suggested that, at minimum, the event should have been held in an upstairs room, with security checking in registered guests at the door. And given the extraordinary price of the pieces, organizers should have only enlisted trustworthy, local jewelers to invite clientele capable of buying them. "To market it in that way is really reckless," Kennedy said. "You don't market 64 carat diamonds with a sign on the outside of a hotel." Despite the confluence of security defects, no one believes the "lone" gunman was really operating alone. The timing of the crime was too perfect, the escape out of the window too quick, and the prospect of moving such an easily recognizable product too overwhelming. The speed and precision with which the thief executed the operation indicates that someone had meticulously "cased" the hotel and the exhibition room. "It didn't just happen willy-nilly," Kennedy said. And once he was on the run, the thief had to have somewhere to go. "He needed transportation," Roman said. "He needed a change of clothes. He needed a safe house. All of that requires some assistance. I'm sure he had accomplices." The identities of the bandit and his potential accomplices are still unknown. But theories about a link to the jewel-snatching syndicate the Pink Panthers, a organized crime group with hundreds of members and roots in the former Yugoslavia, began surfacing in the press almost immediately after the heist. They certainly have the audacity to pull something like this off. The band of thieves and its contractors—many of whom are thought to have received paramilitary training during the Balkans conflict of the 1990s—have stormed into and held up hundreds of pricey jewelry boutiques in 35 countries. The organization has made off with more than $430 million worth of jewels since 1999, according to INTERPOL, which has an entire project devoted to helping the law enforcement agencies exchange intelligence to track and catch the perpetrators. The Panthers—named after the 1963 comedy starring Peter Sellers as Inspector Clouseau— have become infamous for meticulous planning and shocking Hollywood-style theatrics. Very often, according to Kennedy, a "very attractive, well-dressed," woman "with all the accoutrements of wealth," will be dispatched to the target property, show interest in some pieces, and also make detailed mental notes of every wrinkle in the setting. Then, once the central leadership is satisfied with the intelligence, they'll order the job, which is usually completed with two to four armed men with militaristic flair. In fact, just two days before the Carlton operation, two men used similarly spectacular tactics to free known Panther Milan Poparic, 34, along with another criminal, from the Orbe prison in Switzerland. As inmates stood in the exercise yard, the men crashed two vehicles through the outer barriers of the compound, set up ladders to help the inmates clear a barbed-wire fence, and fired their AK-47s to hold prison guards back. Before speeding away in one of the vehicles, they lit the other one on fire. Poparic was the third Panther that managed to break out of a Swiss prison since May. Last weekend, In Serbia reported his capture after 50 officers surrounded his hideout in the Swiss municipality of Chatel St. Denis. A few weeks after the heist, another Panther who escaped from prison in May was arrested at his acquaintance's villa in southeast France, but authorities do not suspect he has any link to the robbery. Though the Pink Panther theory may be alluring, especially for the press, many of the group's basic signatures were absent from the Carlton heist. First, according to experts, it would be extremely unusual for the Panthers to depend on only one man to actually enter the building and perform the robbery; they'd dispatch at least two. And though the crime was certainly impressive, it lacked the deliberately flashy drama one might expect from a Panther operation. Roman suggested that a regional gang or local crime family seemed like a more natural culprit. "They pull a smaller heist, and they graduate to something like this," he said. The high-profile location of the crime also struck Kennedy as an odd choice for the Panthers, who like to control the number of moving variables they're dealing with in order to minimize the risk of something going awry. The Carlton could have potentially presented a dizzying array of employees and guests, and a good deal of chaos. Meanwhile, a jewelry store offers a smaller, more contained space, with only a few threats. John Shaw, the lead Paris-based insurance adjuster contracted by Leviev's insurer, Lloyd's of London, to work with French police to investigate the Carlton case, doubted whether the Panthers would have struck a target without thoroughly scoping it out first. The level of surveillance they are accustomed to conducting wouldn't have been possible on Cannes' busy main drag, Promenade de La Croisette. "It's difficult to stake out there," Shaw said. "It's really high-profile. It's possible, but it's unlikely." Shaw suggested the loose security may have reflected the criminal's connection to someone working inside the hotel in some capacity. "I think it's more likely they got information from the inside," he said. The timing, the unlocked door, and the speed of the getaway all point to this. "I'm working with the police to advance that," he said. In an early statement to the press, the Carlton said that neither its employees or guests were implicated in the incident, and it is cooperating fully with authorities. The hotel did not respond to The Atlantic's requests for comment. But Shaw doesn't necessarily buy the notion that the crime or the criminal was particularly sophisticated. "I think it's just as possible that a couple of local lads stumbled upon the idea," he said. "I mean, 'Jesus Christ! All we have to do is this and that, and then we’re in.'" It could have been a regular garden-variety thug. "You just need some dumb luck from someone who's prepared to point a pistol at you," he added. "It's quite a simple task." Even if local criminals carried out the job, Winckel maintained that the Pink Panthers were likely still operating in the background because only they would have the necessary resources to successfully sell such identifiable jewels on the black markets in Antwerp, Belgium, or Asia. "Only their closed network has the 'partners' to cut or polish large diamonds," he wrote. Kennedy agreed that Leviev diamonds were so big and of such rare clarity and color that they would be incredibly difficult to move. "It's not the kind of thing you could sell without grading reports," he said. "It's either gotta be recut or you've gotta get somebody to give you a false grading report." Not many small criminal networks or locals would have the capital necessary for that kind of forgery. In early August, Lloyd's placed ads in French newspapers and the International Herald Tribune with pictures of the jewels and an offer of $1.3 million to the first person who provides information that leads to their recovery. Shaw has fielded approximately 200 phone calls and emails since the reward was announced. About a dozen are credible, he said. Kennedy seems confident that something will turn up, but Shaw remains less optimistic, saying their recovery is "not probable but it is possible." "We hope with the news, they're being held to ground somewhere," he said. "We don't want them to panic and drop it off a bridge." The possibility Shaw is rooting against—of a thief hopelessly flinging away diamond necklaces—is exactly the kind of final twist that screenwriters might hope for.